A team from Arc Energy Resources are aiming to raise £1,800 for Action Medical Research as they “Race the Sun”. 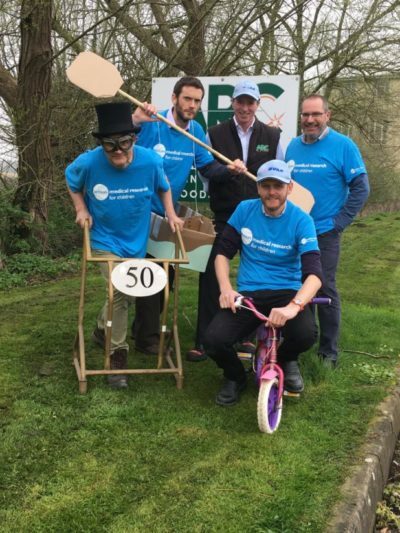 The challenge will see the team set off at sunrise and cycle 34 km, trek 30 km and canoe 3.5 km, in an attempt to complete the course by the time the sun sets. The team consists of Bob Davies, Mark Farrell, Cliff Hall, Martin Sandles and John Haines. The team are (almost) well prepared and equipped for whatever hills, rain or rapids Wales chooses to throw at them. The event takes place on June 15th 2019 and will see the team start at the Digeddi Wildlife Campsite near Glasbury, and cycle along the Gospel Pass, which, at a whopping 551 metres above sea level, is Wales’ highest road. Descending into Llanthony, bikes will be swapped for boots for the trekking section, passing the ruins of the beautiful and evocative 12th century Llanthony Priory and taking in the breath-taking vistas all the way of the surrounding hills and the Wye Valley, until Glasbury. From Glasbury, it is a 3.5 km canoe down the River Wye to the finish line at the Digeddi Wildlife Campsite. All funds raised by the challenge will support the work of children’s charity Action Medical Research, offering hope to the many thousands of families across the UK, who are dealing with the trauma of a baby born too early, striving to support a child affected by disability, or facing the challenge of caring for a child with a rare and devastating disease for which there is no cure. We kindly request your help to support the Arc Energy Resources team by donating any amount you can to this extremely worthwhile cause. Your support will help to make the sore, wet, arms, legs and bums, that will no doubt be experienced over the next couple of months, through training and of course the main event, all worthwhile. THANK YOU!